Found these two. Don't look half bad at all. I'd love a B model for sure! Anyone know anymore? I worked for a communist chinese company last year named "American Wonder Porcelain." They have five factories in China and one here in Tennessee. Yes, it was a fantasy to go overseas and work and on my time off look for P-40's , expecially those used by the AVG. An original Doolittle Raider's B-25 survivor would also be a great find. THE AVG had other aircraft like B-25's and PT-22's. They are quite a bit behind western culture and it may be fifty years before anyone has the ability to look for warbirds over there. Love the tires? 20 inches rims? Looking good, especially that first one. They've found a novel cure for dummy-airplane-drooping-wings-syndrome. At least they seem to remember and appreciate what Americans did in the war....something not always seen elsewhere. The second photo appears to be of an ROC (Taiwan) pre-show, if I am understanding this correctly. There is also mention of a planned Tienanmen Square ceremony in the PRC (Beijing, Peiping, or Pekin) and there is no clear indication as to where the P-40 replicas are. Wheel cover colors are a little different. So,are these Taiwanese-located replicas, or are they mainland China based? The newspaper report, belongs to a Taiwanese newspaper. I don't care where they are...I'm too shocked that people outside the U.S. appreciate what our forefathers did 75 years ago....not to mention the fact that they...unlike many in this country...aren't turned off by the military force required or "offended" (to use the words of a WIX-er in a recent thread) by the violence it took to repel foreign invaders. We've had the luxury of a homeland that's been at peace, (while many people in the world haven't been that fortunate), thus we don't fully appreciate the freedom we have or the sacrifices that sometimes have to be made. 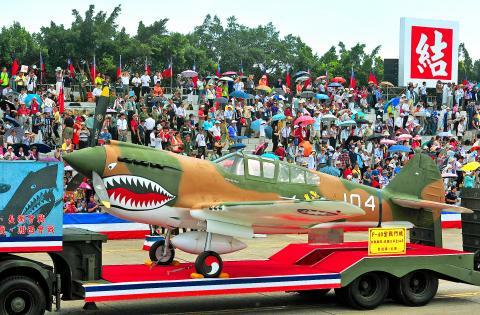 The P-40B replica is in Hong Kong. I agree with Tulio, the other one appears to be in Taiwan. So, neither one exactly is in China, although HK is a special administrative region of China. However, the PRC has always acknowledged the AVG. Probably more as a matter of politics and ideology than honoring anyone's forefathers. They distorted the history of the AVG quite a bit to fit it into the narrative of the war as it related to the competitors for control of China. As just one minor manifestation of this, you wouldn't see a fully accurate P-40 paint scheme in a picture there for a long time, because that ROC national insignia was unwelcome. That may have changed. Considering that very accurate plastic and RC scale model P-40s are made in China by the hundreds of thousands, they ought to have a decent idea what one looks like. Interesting pics anyway, thanks for sharing. The first one is from Hong Kong, so not mainland China. There is at least one P-40 replica in Beijing that I have seen in person. Now thank you guys for the additional information. It will come useful, when deciding one of these days, if going to Taiwan and HK to see airplanes, even if they are replicas. Those replicas look great, and nobody has to worry about a real airplane deteriorating outside like this. It's win for everyone! I assume you've never been to Normandy or Bastogne, then. In each place, it's very clear that the locals still very much remember what the allies did for them (even if it is for tourist dollars in some cases, I'd suspect). A pal of mine who was in the (modern, not WW2-era) 101st Airborne at the time couldn't buy his own drinks in Bastogne when he went there. ....not to mention the fact that they...unlike many in this country...aren't turned off by the military force required or "offended" (to use the words of a WIX-er in a recent thread) by the violence it took to repel foreign invaders. I wrote the offended word, as I know several people who think that way (not that I agree with them, being a veteran myself). Two of them even feel that violence in Europe wasn't justified even to end the Holocaust. How can you reason with someone who thinks like that? I'm quite sure that many elderly people with faded numbers tattooed on their arms would generally say differently. My sense is that, around the world, people have a very good sense of what happened in the Second World War, and are taking a more rational, educated, dispassionate view of it all the time. This is true among our erstwhile allies, erstwhile enemies, and most recently within countries where the historical narrative up until recently has been under tight central control, including China. That does not necessarily translate into automatic support or gratitude for the military exploits of any country, nor should it. If anything, American attitudes lag a bit behind some of the rest of the world in terms of realistic appraisal of the war, and maybe this is the cause of some of the dissatisfaction among Americans that their cherished view of events is not always enthusiastically endorsed. Yeah, and more than anything, they have what I call a "One mindset" view of that (and any other) time. Everyone was 100% behind the war, we all rolled up our sleeves, etc. I was on a tour of Normandy with other Americans in May and none of them but myself, my wife and the guide had any idea a lot of GIs were drafted. They also had no idea that the war wasn't very well received back home (especially by 1944 when the draft classifications were slackened and formerly-4F types were being called up as well as the rationing). In no timeframe will you find a single mindset on anything. This is the same thinking that today leads people to think the US Civil War was fought over one single issue which dominated every thought, action and deed of those who fought in it. Reality is molded by human behavior, which has almost limitless amounts of random activity.